Sausha Seus is a wolf trainer with Wasatch Rocky Mountain Wildlife, an animal training service based in Heber City, Utah best known for its star ursine thespian: Bart the Bear. Sausha handled the wolves that played Lobo and Blanca in NATURE’s The Wolf That Changed America. 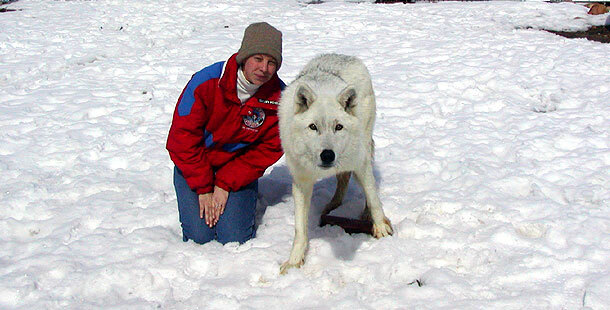 She has been working with wolves for 17 years. Wild wolves can be dangerous, and the wolves Sausha works with are trained, so — as always when it comes to wild animals — don’t try this at home. Here, Sausha speaks about wolf training and what it was like working with wolves on The Wolf That Changed America. Q: How did you become interested in wolves? A: I became interested in wolves because my parents own Wasatch Rocky Mountain Wildlife. WRMW trains and tames wild animals for the film industry. My parents, Doug and Lynne Seus, introduced me to the wild kingdom at the age of three. I was part of a wolf pack by the time I was five. My passion for animals – wolves, in particular – has been heightened by being able to work with them on a daily basis. What was it like the first time you came face to face with a wolf? The first time I came face to face with a wolf I was five. It felt like looking into another universe. The same is true today, 26 years later. The eyes of a wolf pierce your soul. Introduce us to the wolves that played Lobo and his mate. There were actually two wolves that played Lobo and two wolves that played Blanca. The main wolf that played Blanca was Cree. The double wolf for Blanca was Spirit. Both Cree and Spirit came from Seacrest Wolf Preserve, a well-respected educational facility. Cree is the peacemaker of the pack; he is serene and sweet. Spirit is the wolf in our pack that initiates play. Spirit is a happy go lucky wolf. The main wolf that played Lobo was Coda. The double wolf for Lobo was Coda’s brother, Yukon. Coda and Yukon both came from Bear Country (an animal preserve in South Dakota). Coda is somewhat of a trickster wolf and will try to get away with things like pretending he isn’t listening. Yukon is an aloof wolf. He is very self-actuated. Off set, the wolves exercise, eat, and play. They get to run in the Rockies by pristine mountain lakes and rivers. They get to go swimming in the backyard pond and dive for cookies. When dealing with wolves, how do you gain their trust? The wolves have been part of the family since they were tiny puppies. They have never been treated unfairly or unjustly. Frankly, they are loved as members of our family. How do you communicate with wolves? What training methods do you use? Communication with wolves is verbal and non verbal. Wolves are masters of body language and respond to it immediately. We use the positive reward method of training. The wolves are never forced to do anything. Wolves love to learn and revel in praise, reward and affection. Ear scratches or belly scratches are the best! Wolves souls are wild and free. You can only ask, you can never tell a wolf to do anything; they do it because they want to. What was a typical day of shooting The Wolf That Changed America like? The typical day of shooting began at 4:00 a.m. The trainers would arrive at Wasatch Rocky Mountain Wildlife and load the wolves in their cozy trailer. It was always before dawn and sometimes the wolves would look at us like, “Are you serious? We’re getting up this early again?” By call time (5:30 a.m.), the wolves were excited and ready to work. Usually, we would shoot from 5:30 to 12:00 noon. We would let the wolves rest in the middle of the day and begin shooting around 4 p.m. until the sun went down. The days were long but the people involved made up for the lack of sleep! How did the wolves react to the camera and crew? The most positive aspect of this shoot was the fact that it was so small! We had a cameraman, a director, a production assistant, and the wolf trainers. A couple of days we had a soundman. This made up a crew of six or seven which worked so wonderfully for the wolves. The wolves were able to know everyone and were very comfortable performing. Describe some difficult or frustrating moments you had on the shoot with the wolves. The most difficult time on the shoot was a night shoot. The temperature dropped below 0 degrees Fahrenheit and most of us were not prepared for the weather to turn that quickly! Have you ever been frightened by one of your wolves? What are some of your favorite memories of handling wolves throughout your career? Some of my favorite memories are, of course, wolf puppies. There is nothing more precious than a baby wolf howl. What can humans learn from wolves? The sense of utter and complete devotion to family. An alpha male wolf will hunt and bring back food in this “belly basket” and regurgitate it for his mate and pups. The alpha male will starve himself in the process if necessary. The bond of a wolf is about loyalty, and it is unbreakable.